Something shifted in me between Wednesday and Thursday. 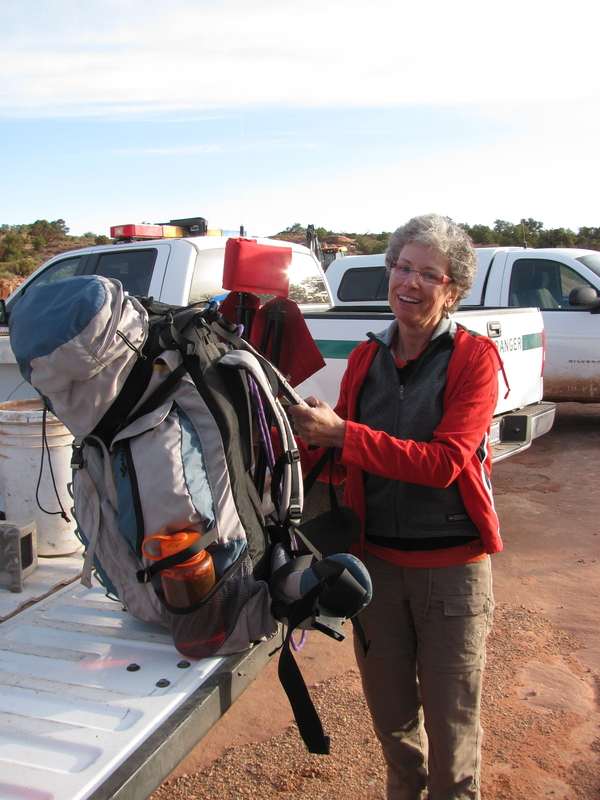 As I methodically re-packed my pack Thursday morning, adding what I might need for protective clothing, subtracting extraneous baggage, I reviewed my objectives. I saw what I wanted to happen. I asked God for grace, strength and clarity. I mentally prepared. Because we were going to go late into the night, we had all morning off, which I used to read and study and get my head around concepts that had been fuzzy. I finished my take-home test. I had had little awareness of how burned out and stressed I had gotten in three solid days of massive information overload, but the morning off replenished me and I arrived at the training site as ready as I’ve ever been. And… it was a VERY GOOD DAY. Things began to click in my head or gut. I no longer was questioning every decision I made (“Bowline or figure eight?” “Wrap-3-Pull-2 or High-Strength Tie-Off?”) and I found a well of confidence that had been AWOL all week. We ate our sack suppers at sunset and then attached our headlamps to head up the cliff for Night Operations. The half moon illuminated the trail and stars began twinkling all around. Over the radio came a scenario in which the local sheriff requested our assistance to locate a missing boy. He might be on the mesa top or might have gone over the edge. Our Incident Commander assigned me and another student to rappel down in the dark to search for “Little Jimmy” while the others rigged up belay and mainline systems for lowering a litter in case we found him injured. I’ve never rappelled in the dark. 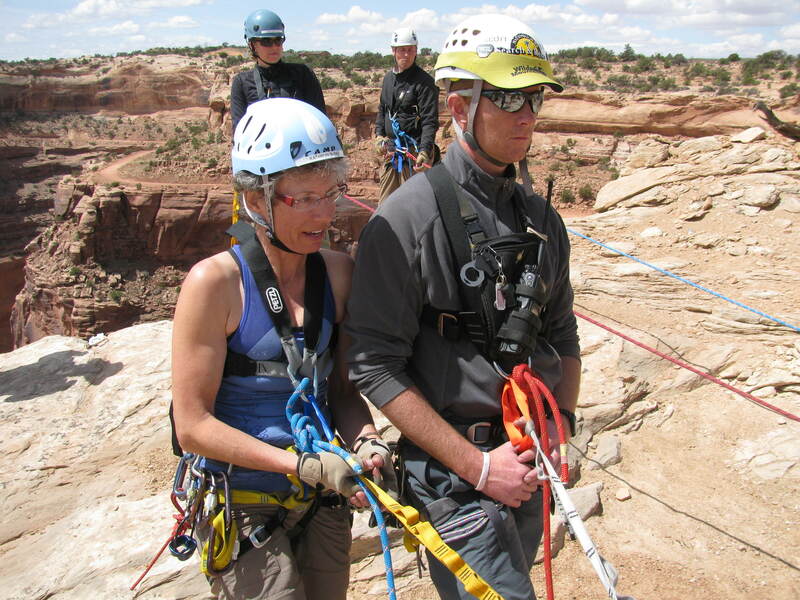 Instructor Brent kept an eagle eye on me and watched me tie myself in, load the brake bar rack, check all carabiners, and practice tying off if I needed to stop in mid-rappel. He sidled over to me and quietly asked if I remembered the “wine talk” from yesterday, as he could see I was tensing up. I smiled at him and consciously let my shoulders and neck and back relax as I took a few deep breaths and went over the edge. Adrenaline rush. By the time we ‘found Jimmy’ and cleaned up all our gear and re-assembled the team and packaged everything up for overnight, it was midnight. We all agreed that this exercise had been Really Really Fun. In my own silent thoughts, I acknowledged that the day was a major turning point emotionally. It’s unusual for me, but tears were near the surface today. The other eight participants in my group all seemed to be “getting it” way faster than I was, no matter how much I studied and practiced. Oh, there were components that I knew I was understanding, but I certainly lacked the ability to put it all together and SEE how rescue systems are created and what elements are needed. Each evolution of a scenario has a new challenge introduced, or sometimes several. Today we added the litter, which is rigged with a haul system the likes of which I have never seen before. There are single lines and multiple-strand-and-pulley lines going off of it — to the belay rope (litter attendant), main line (victim), metal frame of litter, bridle above litter… my brain has difficulty following it all. Each connection, remember, has to have redundancy in it so that if any one piece were to fail, the system would still function. Then the instructors may come along and throw a knot into a rope that you are trying to pass through a pulley! Your job is to problem-solve, or (in my case) grab someone and ask them for ideas. I have known for a long, long time that I am far more comfortable following directions than giving orders, and being rotated into the Incident Commander position scared the daylights out of me. Somehow I survived it, but the funniest comment of the day was in the middle of that agony when Mr Kindly Instructor pulled me to the side about ten yards and said, “Kathryn, you just need to RELAX. You are so stressed out! I feel like I should tell you what a mentor told me when I was training for Ski Patrol: ‘Before work, have a glass of wine and you’ll be fine.’ That was a non-government job, of course. But, seriously, you need to step back and begin looking at the Big Picture. Your job is to keep everything in view. Stay here with me and don’t walk back toward the action. You can see everything you need from here: your edge attendants and your main line. RELAX.” He smiled a smile that suggested that everything would be okay in the end. Winds were blowing at at least 35 mph today and gusts were far greater, probably nearing 50 mph on our exposed cliff. My housemate had lent me her waterproof shell, fortunately; we were pelted at various times by huge raindrops, blasts of sand, and small hailstones being flung sideways. Not until the lightning appeared at 4 pm did they call the exercises, however, and get us off the cliff as quickly as possible. Tomorrow: NIGHT OPERATIONS with headlamps. If I think it’s challenging in broad daylight, I hardly want to consider what it will be like in the dark and wet and quite cold conditions. Best if I don’t think too much about that and just take every layer I own. General Douglas MacArthur said, “Age wrinkles the body. Quitting wrinkles the soul.” I have 40 pages to review in my manual before getting back out there tomorrow. I had the sweetest sleep of utter exhaustion after Day 1. Day 2 was ramped up, faster paced, and more material to master. It was a constant battle to keep my focus and refuse to allow myself to feel overwhelmed by the glut of information. I kept my game face on and got through. First we learned several ways to secure an anchor system to various points above our cliff edge: juniper tree, bolts in rocks, etc. It’s not as easy as it sounds when you include fancy techniques like pre-tensioned tie-offs at the front or back end of your rope. All I could think of was that my engineering-minded daughter would find this a piece of cake, while I struggled mightily with the concepts. We were given a scenario in which a visitor with a shoulder injury needed to be lowered over the cliff face to drive him to a medical facility. The Incident Commander then assigned tasks to each person: Belay Line, Main Line, Edge Attendant, Litter Attendant, Safety Officer, etc. Throughout the day we rotated through each position and became familiar with what needs to happen in each place. 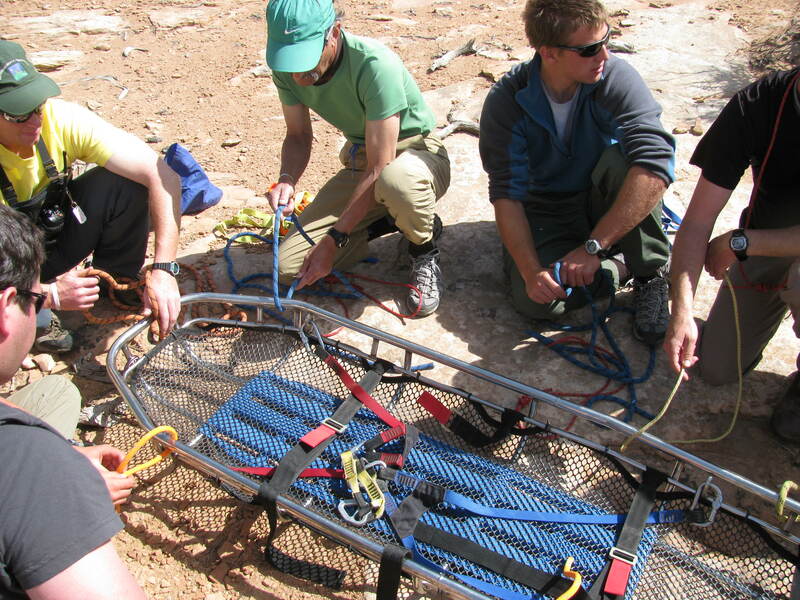 The belay and main line managers have to rig anchor systems that will hold the proper amount of weight and be completely redundant, which means that if any part of the system were to fail, a back-up piece would kick in and prevent injury. The edge attendants (2) must secure themselves to ropes and are the only ones allowed within ten feet of the edge, so they handle anything related to equipment and people going over. 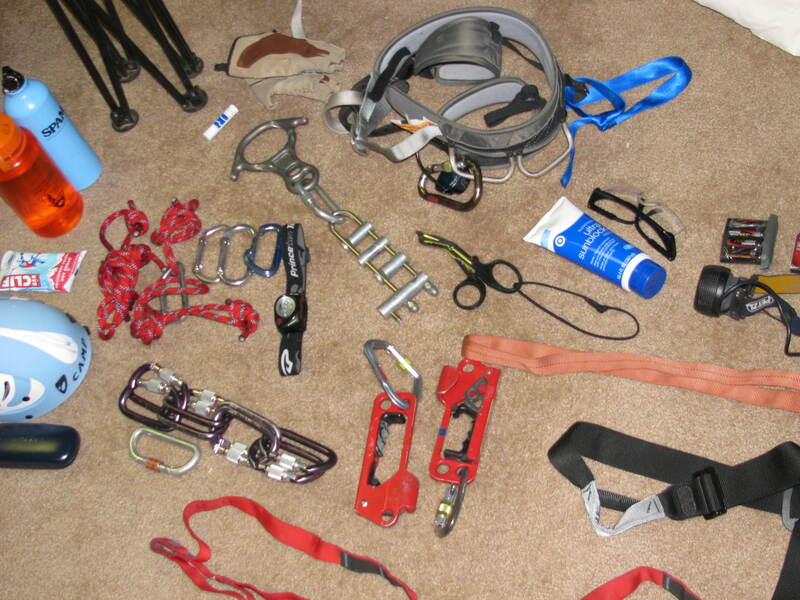 The safety officer’s job is to examine and touch every single knot, carabiner, rigging system, personal tie-in, and anchor to check that they are properly done. That requires knowing how many inches of tail are supposed to be on each knot, what direction the carabiners ought to be pointing, and whether those load-releasing hitches are tied right. 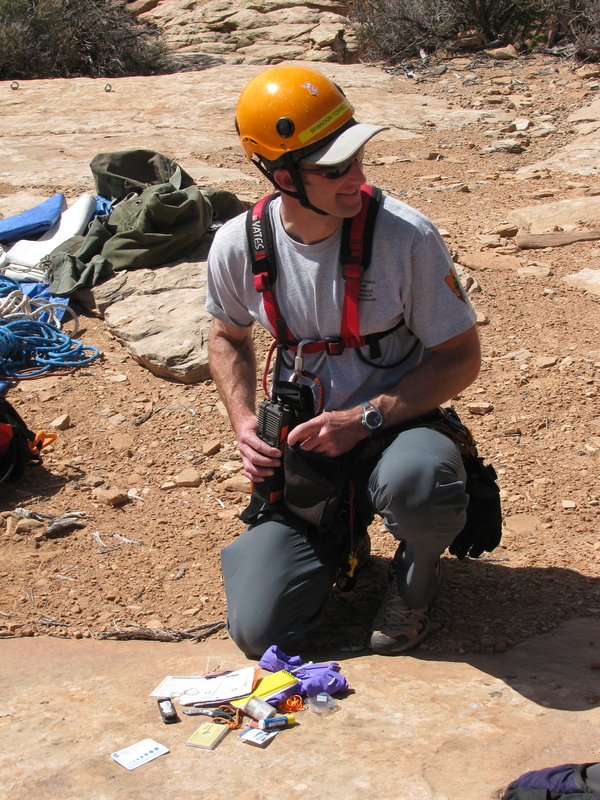 The litter attendant (even when no litter exists, as this patient had only a shoulder injury) is responsible for accompanying the injured party over the edge and issuing commands controlling the rate of descent. Everything in the mission revolves around this pair. The Incident Commander oversees every detail and is the communications hub. S/he must know how each station is doing at all times and how many minutes until all are ready for the mission to begin. My problem is that things move so quickly that there is not enough repetition to secure items in my mind. Last night I went over to Ed’s to re-learn how to rig a pulley system that would provide 3:1 mechanical advantage. This is starting to come together… but today they add a full litter and an injured patient who needs to be properly secured to the litter, and the litter to the attendant and to the system. Oy. Oh, one more thing: a huge cold front is moving through Utah today. This means winds of 20-35 mph ahead of it, with 45-mph gusts. We are on the top of an exposed sandy cliff trying to manage a rescue. We will need whistles today, and goggles. At least we’re missing the snow that Zion NP is going to get. This poor pack was loaded by a complete amateur, who can barely heft it. That is going to change. I felt like I was trying out for “Survivor.” Heck, my pack weighs more than 1/3 of what I do! Glancing around to size up the other trainees, who were hefting their huge packs with a grace and ease that made me marvel, I resolved that I would NOT be the first one booted from this island. Every last one of them was Law Enforcement, wilderness fire fighters, Search & Rescue, back-country or river rangers. Only one was Interpretation, and that was me, and that raised eyebrows from some others who asked “How did you pull that off?” Interpretation is historically its own division and gets involved in rescues only after all other avenues have been exhausted. A few folks asked me if I thought my supervisor would support me in getting out there for rescues, to which I responded that I hoped so and would look forward to talking with her about my desires to do just that. After introductions and a serious safety talk, we were broken into our four training groups for the week. Each has nine students and four instructors. 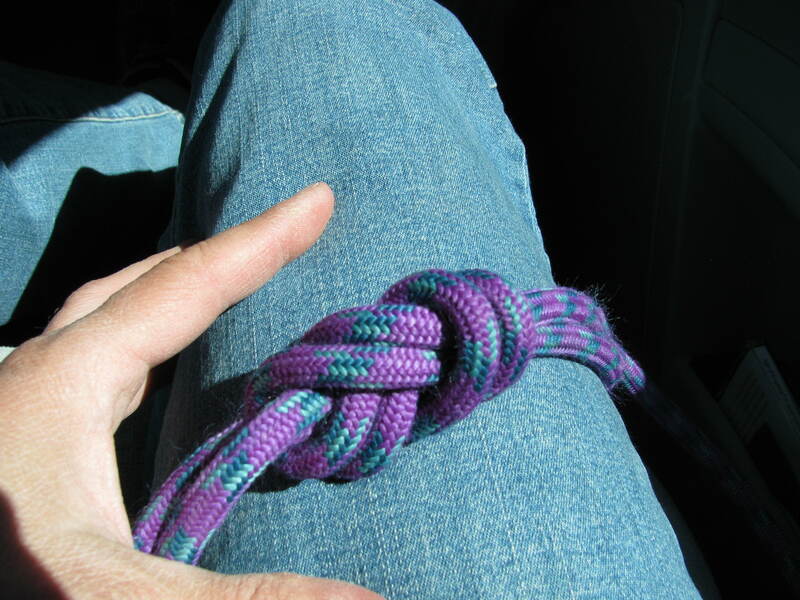 The much-anticipated Knots Test took place right away, and I PASSED with ease. (Many thanks, Ed.) I have a little work to do on my Munter Hitch, but that will be easy to master. 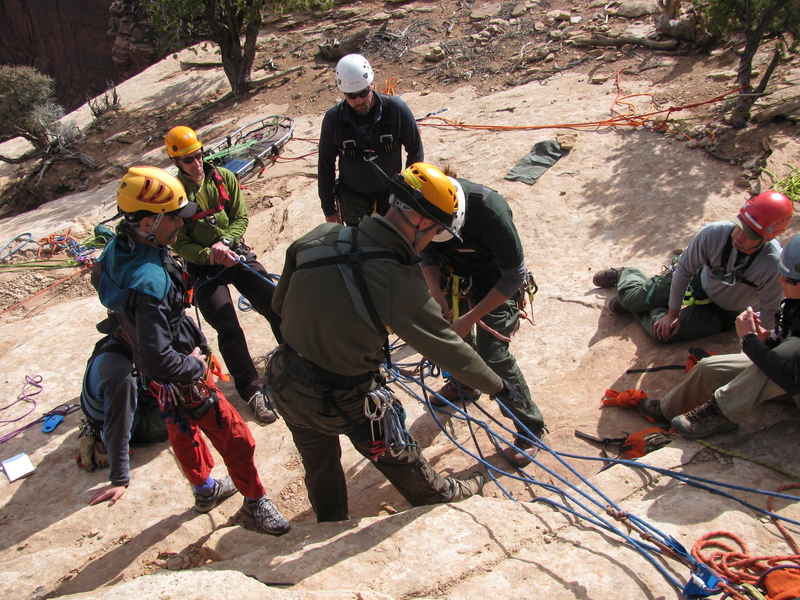 Most of us have rappelled before, but some hadn’t, so we set up for that. 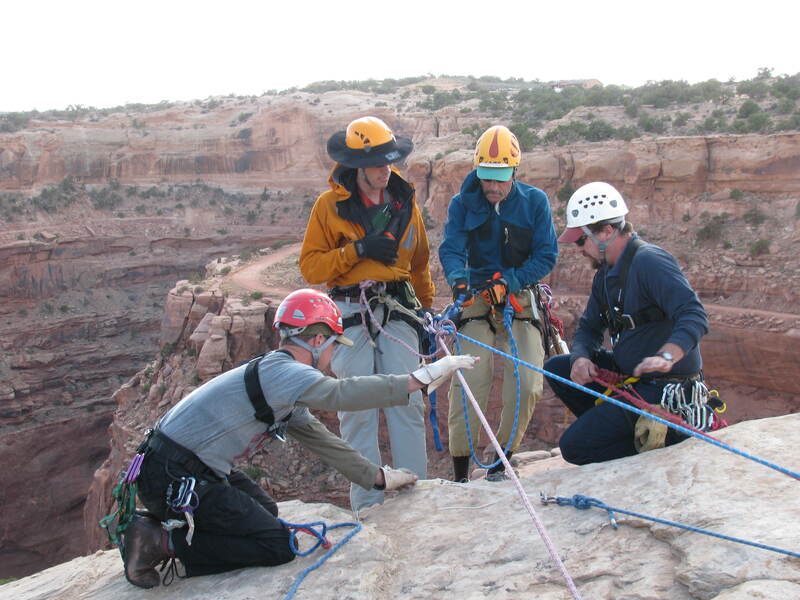 We had to learn to tie ourselves off in mid-rappel so our hands would be free for rescue tasks. I was watching the clouds build up as each hour passed; it was a glorious 72-and-sunny day, but in Canyonlands that can change in a flash. As our day wound down, the final hour was to be a lecture on Situational Awareness and factors that can diminish our attention to our environment. The teacher moved the class from clifftop to parking lot because of the threat of weather, and the wind still blasted sand into our eyes and ears and teeth, but it was a great illustration of the importance of not allowing distraction to deter us from our task. At the close of the day I looked around with satisfaction and gratitude. One down, four to go. The leader had promised us that the first day would start off easy, but as the week progressed we would be increasingly challenged. I know I have to take things one day at a time, and have my nose in the manual every evening. Final test Friday is open book, so I don’t have to memorize kiloNewtons and breaking strengths, but I sure do have to work hard to know what I am doing. It’s Sunday night. I take over the living room to lay out all my paraphernalia and make double sure I forget nothing; let’s not make my neophyte status any more obvious than it already is. I don’t know how to use some of my stuff, nor even how to carry it appropriately. I’ve little idea how to arrange it within my large loaner backpack in the most efficient manner. Sleep is fitful and interrupted. There is a lot going on subconsciously. Monday dawns clear and mild, which will make the day go a LOT better. I dress (in layers, of course) and slather myself with sunscreen. An entire day on the rocks can burn one to a crisp. I remember to breathe deeply and I deny myself any opportunity to obsess, to wish I had more experience, or any other ridiculous self-sabotage. 45 minutes after the big white government F-250 pick-up collects me, we find ourselves pulling into a parking area spilling over with equally-anxious others. Dozens of parks are represented. Every possible experience level is represented. I just want them to blow a whistle and get this thing started, so I can get back to feeling normal again. Three months of waiting is finally over. I can’t decide if it’s more like throwing up so you can feel better, or giving birth so you can feel better, but something has got to happen soon. I am what I am — and that means the full meal deal: physicality, inexperience, willingness to learn, enthusiasm, distractibility. I’ve made a conscious decision to do my very best, learn everything I reasonably can, and not measure success or failure on the first day. I know I will have helpers to whom I can go for assistance in learning and understanding things. I don’t know how much blog time I will get this week, so thank you for your patience. If you are a praying person, I would covet your prayers for deep peace, clear thinking, safety, strength, good retention of material, and a tangible sense of God’s nearness and assistance. Thanks! Let the adventure begin! As I was perusing my iPhoto files, a few just need to be shared on the blog — for no special reason except that they help you get into my desert world. Click on any to enlarge. (A) Why do people always look over the edge? 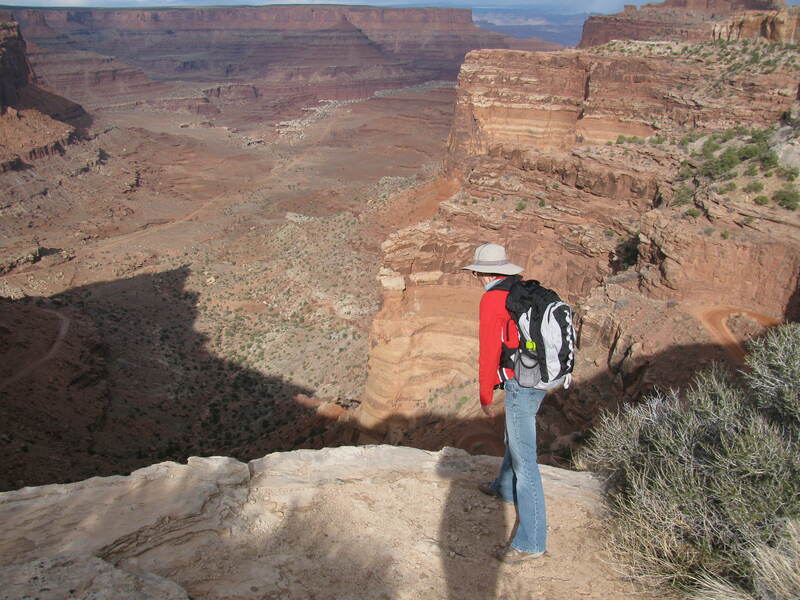 It’s at least 600 feet down, I think, at this Shafer Trail Overlook. Can’t help myself. Very cool place. 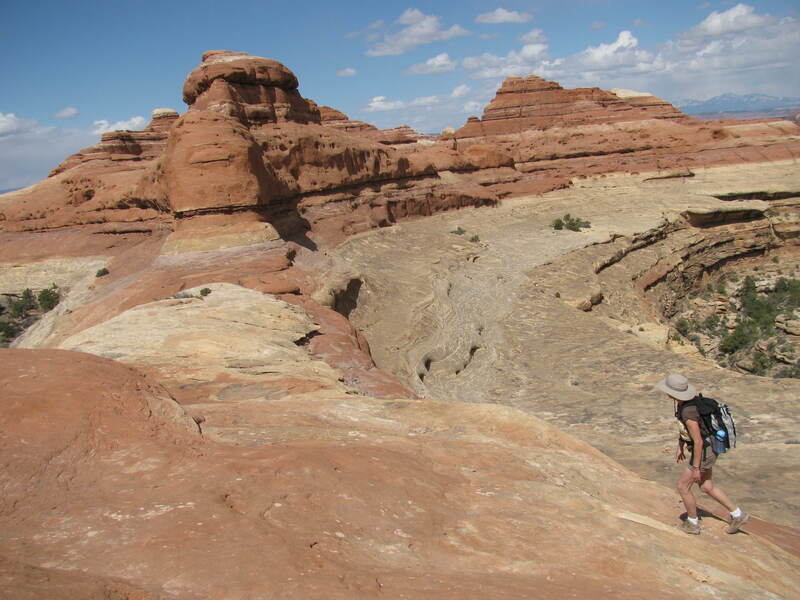 (B) Geology lesson: The wavy rock layer is the Dewey Bridge Member of the Carmel Formation. Old tidal flats, mid-Jurassic. 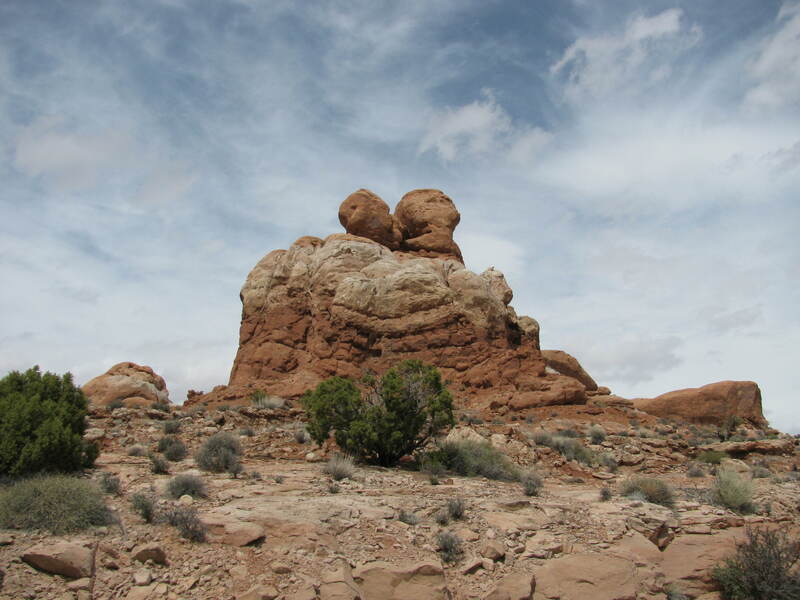 It would seem that Dr Seuss took inspiration from this for all his rock illustrations. Gotta love the Dewey Bridge Member. (C) Morning Glory Arch, 6th largest natural rock span in USA at 243 feet, is on BLM land a couple of miles outside the park. 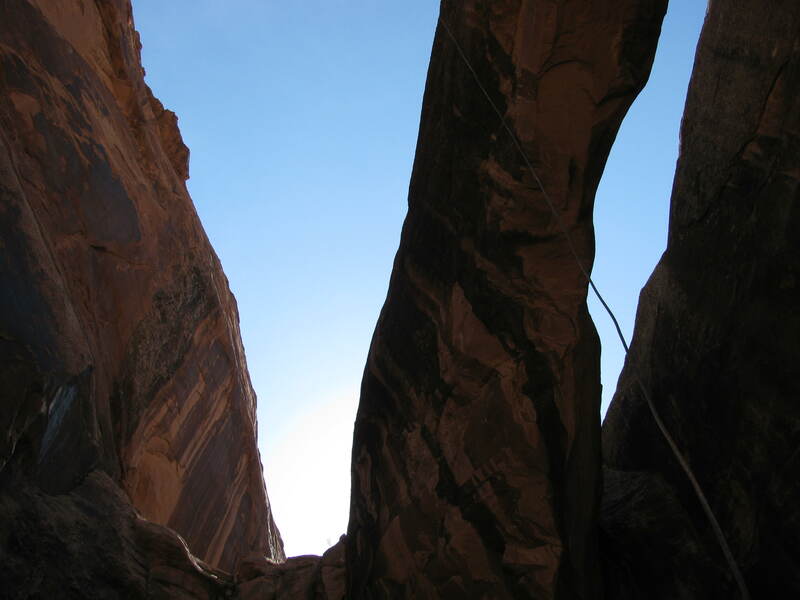 Since it is forbidden to rope any arch within the park, this one does get regularly climbed. You can see my rappel rope hanging there. 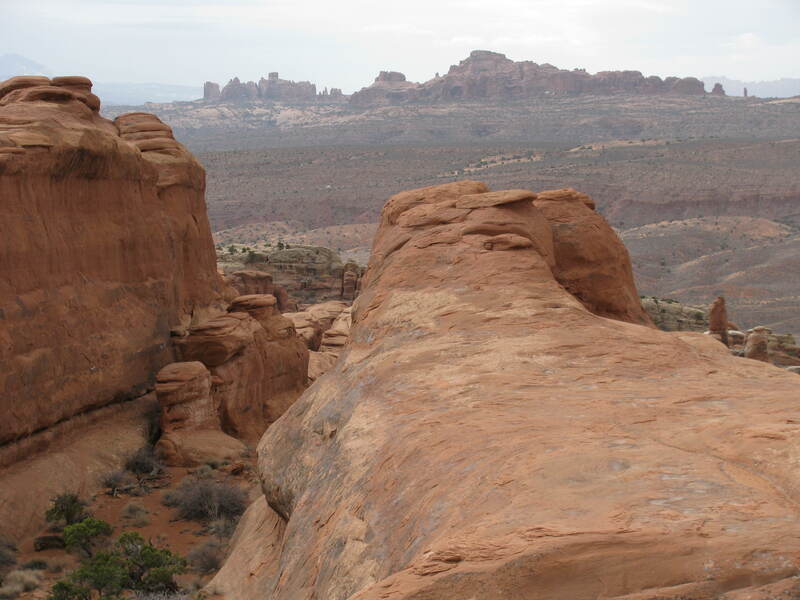 (D) The Fiery Furnace is an area of tightly-packed sandstone fins, tall, mysterious, and inviting. Rangers take tour groups in there twice daily, and adventurous individuals can secure permits to explore on their own after orientation to resource protection issues. In the last month we’ve had two broken ankles in the Furnace, and Law Enforcement put this site in their GPS as an LZ (Landing Zone) for a helicopter in case a medical evacuation becomes necessary. Can you believe a ‘copter can land up there?!?! (D) Atop a fin in the Fiery Furnace, an LZ exists. 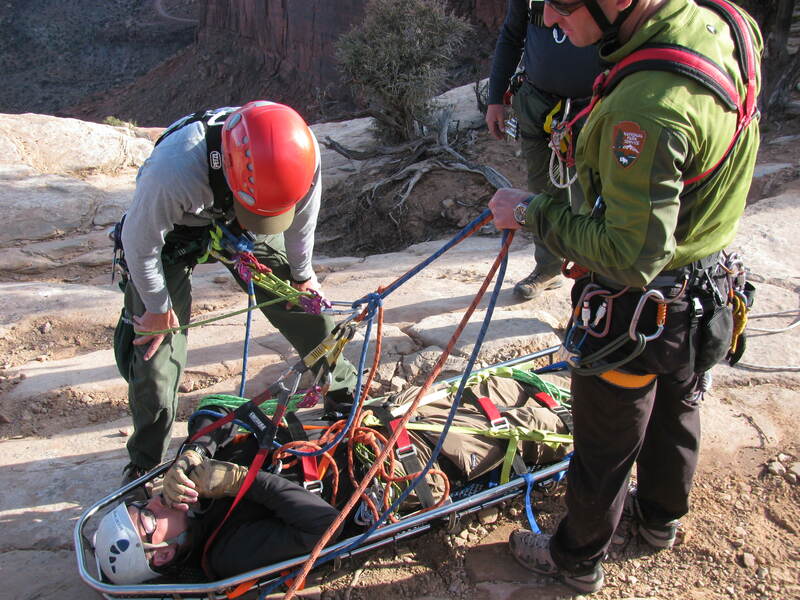 In 72 hours I will be en route to Canyonlands NP for the first day of Basic Technical Rescue. While I know that I can handle five days of intensive training (I feel physically ready and mentally ‘on my game’), there is a large degree of trepidation here. It’s normal, but it’s unsettling. I am playing the comparison game — measuring myself against the other participants, and wondering what the heck I am doing among them. Law Enforcement, Search & Rescue, those types — people who have been climbing for years. My housemate Lauren and I went top-roping last night, just because it was a perfect opportunity to get out of town a few miles and tackle two climbing routes along the Colorado River. [Top-roping: Lauren hikes to top of cliff, secures rope, rappels down, and then we take turns climbing the rock face while belaying each other. Fun, quick, convenient climbing.] As I clumsily attached the rope to my harness I realized that I will be the least experienced climber on the training, having climbed only last fall for a couple of months. That makes my learning curve far steeper than that of other trainees. But, on the positive side, as soon as my feet got on the rock, it just felt RIGHT. It’s a good place to be. Judging from my previous post, there is a strong connection/attraction to rocks. I’ll let you decide whether “rocks” is a noun or a verb in the post title. Either way, I was fascinated on my hike there today. This is a main drainage in the park, and apparently does not dry up. 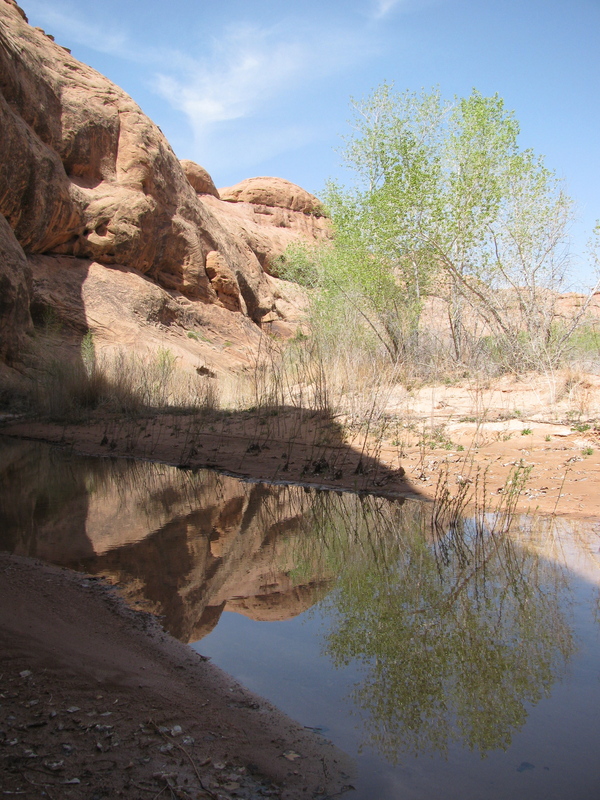 Cottonwoods and willows occupy the wash, and so do nesting raptors. We were there to locate nests for Cooper’s Hawks, Red-Tailed Hawks, and anything else we could find. The red rocks won’t leave me alone. I find them beautiful and mysterious and solidly comforting. 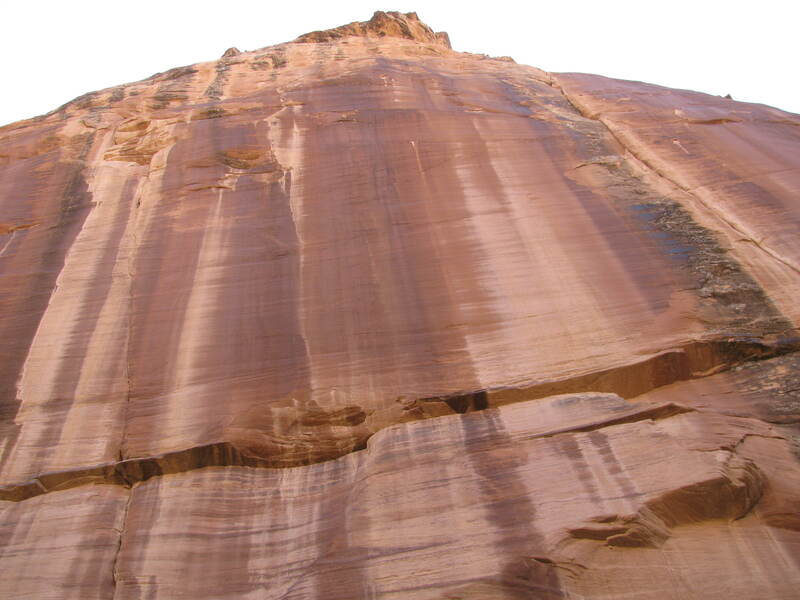 The stripes (A) on these rocks are iron oxide and manganese oxide deposits, accelerated by run-off, taken from blowing sediments in the air, adhered to the rock surface by bacteria. It’s called Desert Varnish and it’s lovely. It may take 1000 years to form a layer as thick as one sheet of paper. 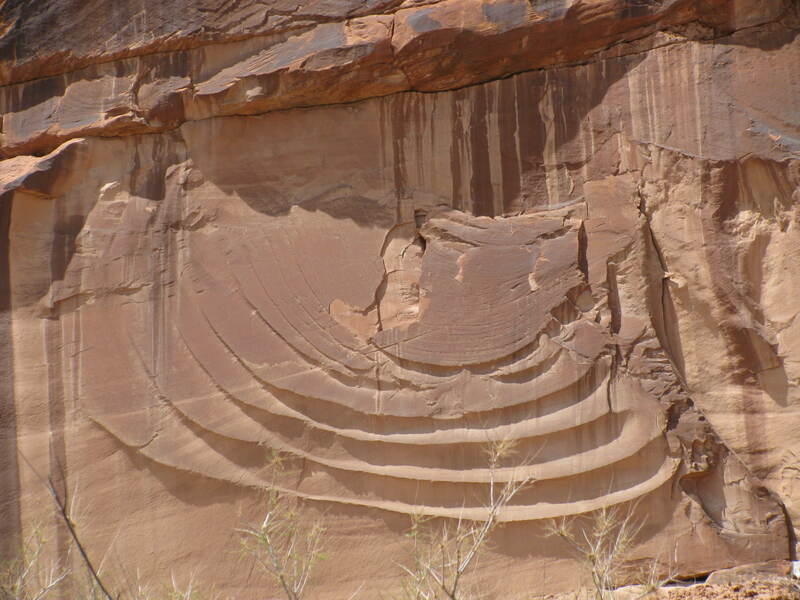 I’m intrigued again and again by the way sandstone fractures. This face is undercut in multiple layers; one can see a bit of the process of arch formation here (B). The visual texture is quite pleasing. 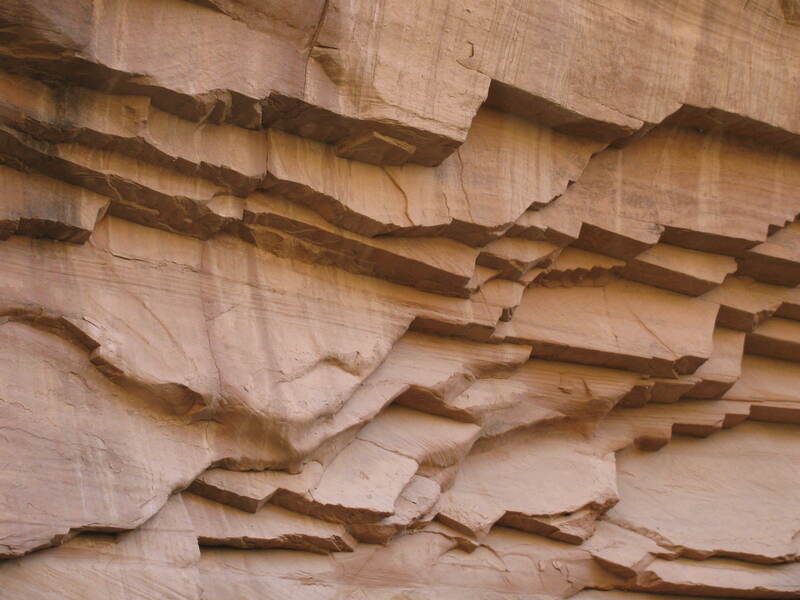 Conchoidal fractures (C) happen when a slab of rock separates from the cliff wall. 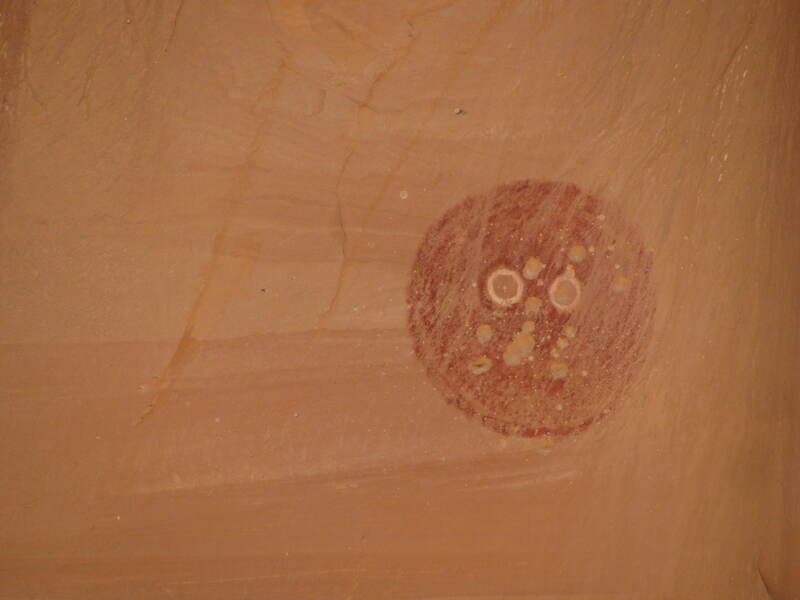 This example is particularly endearing, with its concentric circles. It was huge — scores of feet across. And then, rounding a bend in the stream, THIS stares you in the face — an ancient pictograph (D). I am accustomed to seeing rock art in groupings, with multiple images on panels or nearby, but this one stands utterly alone. Sadly, it has been repeatedly used for target practice by rifle-bearing idiots; still, it commands my attention and respect. Some places are purely refreshing. 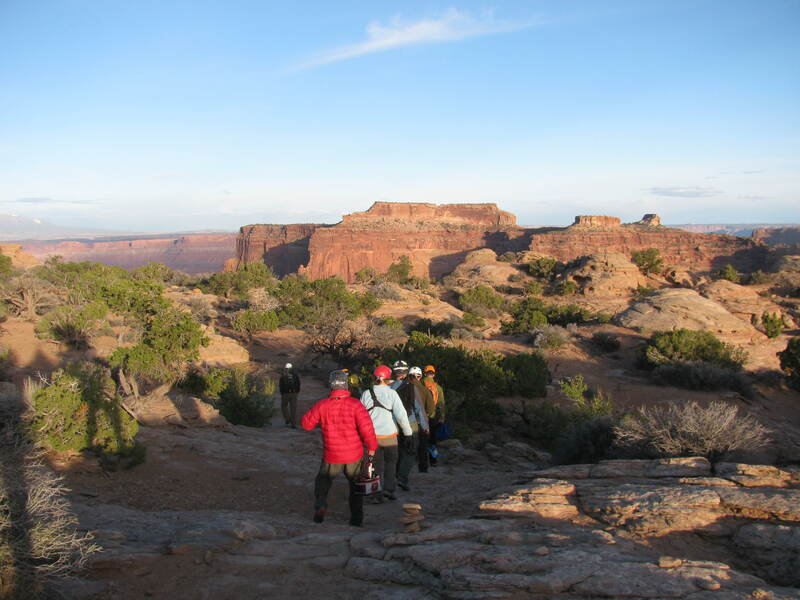 Especially after working in a heavy-use park like Arches, with its nearly one million visitors per year, getting away to a neighboring park with fewer people around is extra wonderful. 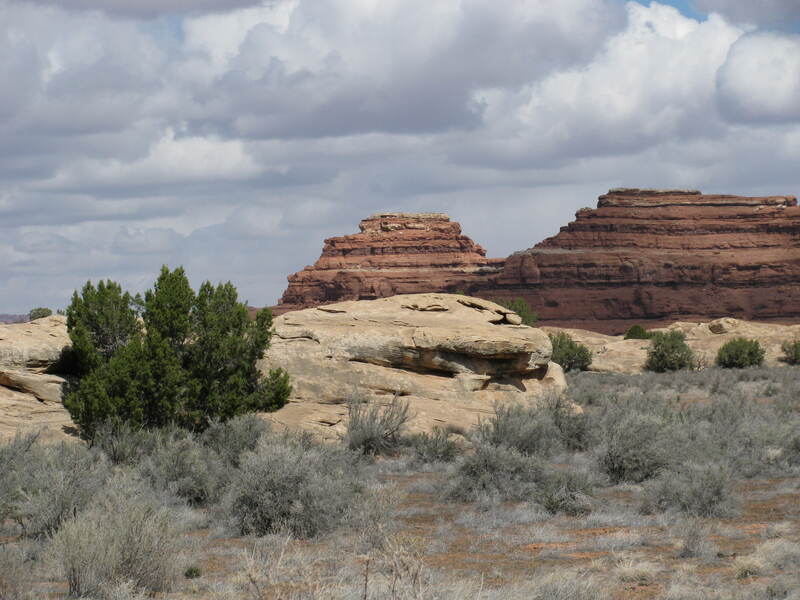 Yesterday a friend and I went to The Needles, the southern district of Canyonlands NP, about an hour and a half away. 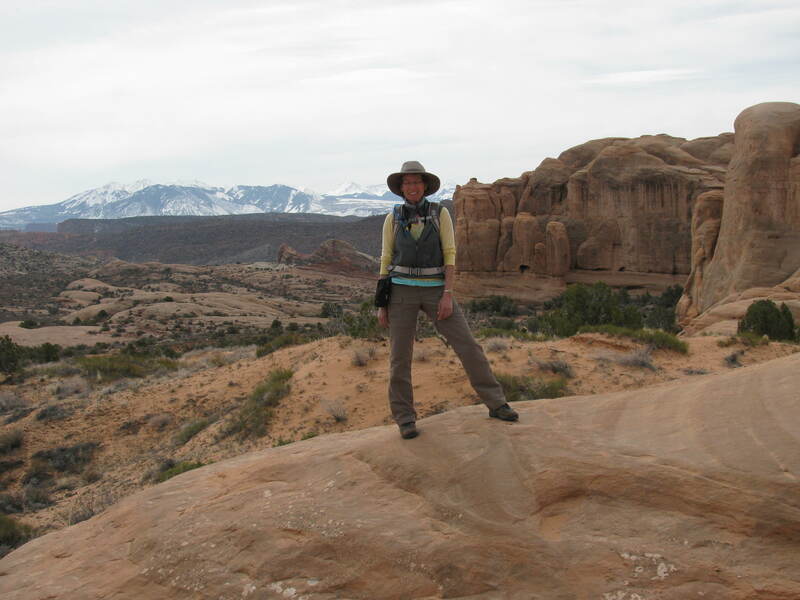 Its views are quite different from Arches’ views — buttress-y, fortress-y, rock-climb-y, with a variety of habitats. On a flawless spring day, we had the perfect 7.6-mile hike. I realized 3/4 of the way through it that I NEED to be active in order to feel my best. I noticed that very strongly upon my return to MN last August, and I did all manner of active things to keep myself in that groove. Minnesota, however, is a far cry from Utah; one must be ever so much more creative and resourceful to find things to do. I thought again of how exquisite it is to have a pool of Very Active Friends who will not shy away from adventure in our off hours. I’d be interested to hear what you have discovered about your ideal activity levels. What does your body tell you? Have you learned to heed its messages? Do your friends’ activity levels influence you more, or do you influence them?